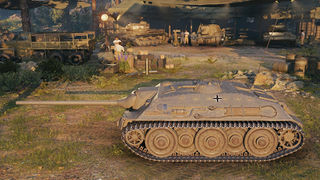 Der E 25 ist ein deutscher premium Jagdpanzer der Stufe 7. Die Entwicklung des E-25 war Teil des „E“-Programms unter der Aufsicht des Waffenprüfamtes 6. Der E-25 wurde durch die Firma Argus (Karlsruhe, Deutschland) unter Führung von Dr. Herman Klaue entwickelt. Es wurden keine Prototypen gebaut. A premium tank which, if tanks were personified, would be considered to be that of an impish nature. An incredibly fast, agile, and stealthy tank destroyer, earning It the nickname of the smiling assassin, the E-25 brings an extremely high rate of fire to whatever part of the battle it visits. Because of its low damage per shot, the E-25 punishes unaware or distracted players disproportionately more than any other and is capable of borrowing tactics normally shown by fast medium and light tanks. Do not be surprised if in a heated battle a player finds themselves with a heavy tank fighting in front of it, and an E-25 suddenly chipping away at their health from behind in what was supposed to be a safe area. Uses of such tactics allow the E-25 to disrupt a battlefield in such a way as to turn what was a stalemate into decisive victory. This tank was removed from in game tech tree on the 22/12/14 and from the gift shop on 15/1/15 E 25: Withdrawal from Sales due to it being blatantly overpowered. Overall, the E-25 should be played as a very mobile sniper. Distance is your friend, mostly because of your very poor armour, but also because you sport top accuracy, allowing you to hit weak points even at distance. If danger approaches, use your speed to flee. If help is needed elsewhere, you can assist swiftly. But never try to hold a position by yourself; you simply aren't suited for such a role. Your gun has an extremely high RoF, which allows you to deal consistent damage against exposed enemies. If you manage to destroy the track of a tank, you'll be able to keep it stuck there until an enemy chases you off, or until the target is destroyed. 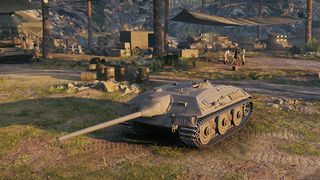 However, bear in mind that your low penetration means that you'll have trouble penetrating a handful of Tier VII tanks, and most Tier VIII tanks. 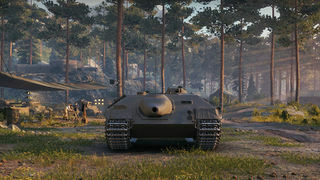 Luckily, your accuracy should allow you to hit weak points, and the low premium ammunition costs should also mean that even the heaviest of armour can eventually be damaged. The E-25 features an impressive 26.62 hp/t ratio, making it quite fast, and allowing you to reach positions quickly, as well as climb into some hard to reach locations only light tanks normally can reach. Your speed also allows you to flee and relocate swiftly, which is something you shouldn't think twice about when the situation calls for it. It is easy to become arrogant and cocky when driving this particular tank destroyer, which often heralds the destruction of many players who drive the E-25, so you should always be aware and remember than survival is the key. This speed and agility allows you to play like a turret less medium tank with very capable DPM. Flanking distracted enemies will allow you to hit their generally poor rear armour, allowing your ridiculous DPM to cripple any tank within a minute. Your armour is, unfortunately, quite poor. With some luck you'll bounce Tier V tanks, but that's mostly it. You should never depend on it. As said before, DO NOT try to hold a position by yourself. You may emerge victorious on a 1v1 situation, but a second tank will already be enough to have you killed. An interesting feature of the E-25 is its low height. Not only does it provide an extremely good camouflage rating, but it also allows you to face hug some tanks and make them unable to hit you. An interesting, but quite risky move, is to head in and hug a heavy tank from its side. You won't be able to hit it, but neither will it. In the meantime, your allies should be able to kill him (of course, the opposite applies as well, this should be done only when you are sure no other enemies can hit you). Essentially, the E-25 excels as a support sniper. This is a supporting tank. Most times you won't be doing the heavy work, but you'll be supporting as much as you can. That's you role, that's your strong point. Take advantage of your mobility, get into good sniping positions, and fire away at what your team spots. Use your camouflage to hide when the enemies spot and focus on you. Help where assistance is needed, flee when the situation becomes dire. Try to always keep your distance from the enemy. The E-25 may not be the best money maker, it may not have the best DPM, alpha nor penetration, but it's probably one of the most entertaining tanks to use, especially when used properly. The actual planned length, width and height of the E-25 is 5.66m, 3.41m and 2.03m respectively. In World of Tanks, however, the E-25 is significantly smaller, measuring only 4.5m in length, 2.78m in width, and 1.75m in height.